Mommie and Daddy decided to paint the walls in the living room. It used to be blue and now it is a light pumpkin color. Just in time for fall. The room looks Thanksgivingy. Teehee! I supervised the painting mostly from my spot on the sofa. Sometimes I would check and sniff the materials but Mommie said not to get too close or I would get paint on my fur. They were joking that it would be impossible for them to finish the project without me getting some paint on me for sure because I was being nosey about everything that was going on. But isn't that what supervisors do? Anyway, I was pretty careful about avoiding the paint. But when I had to go out to potty, I came back in to ask for my reward treat and forgot all about the paint. So I jumped up and down and ran to my treat box. I stepped on a wet paint brush and so my feet were all pumpkin colored. And I left pumpkin pawprints on the carpet. Oops! Good thing the paint is water based so they just had to rinse my feet and legs at the sink. Mommie made me a potty station on the balcony. She got tired of scrubbing the balcony floor everytime it began to stink because of my pee. The new potty is just the right size for me. It is made out of those drain pans used for the water heater. Mommie drilled some holes under it and attached a pipe so that all the pee goes down the drain and into the gutter. Then she put some rubber mulch in there. I was scared to use it at first but after a few days, I got used to it. 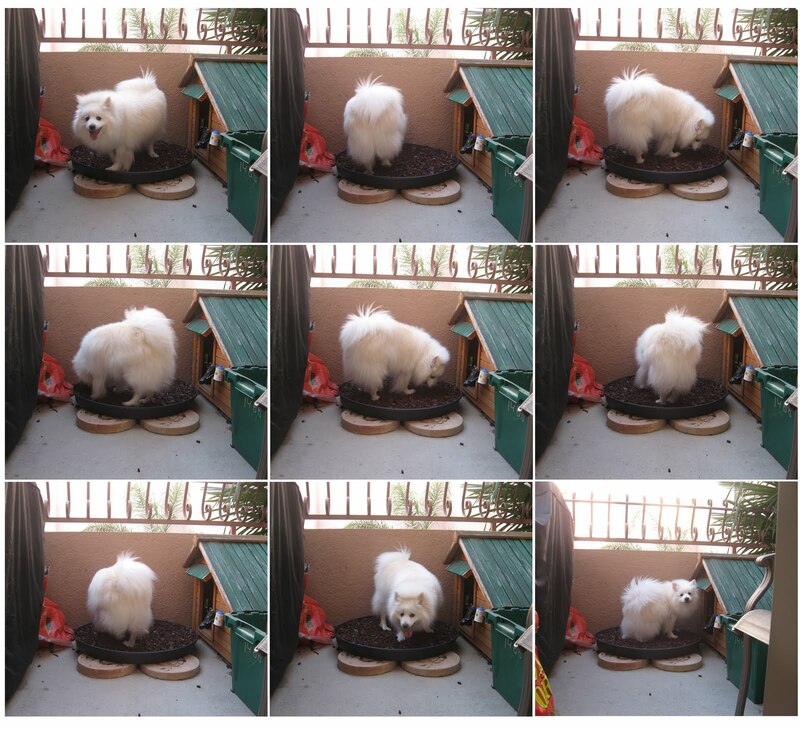 It is round so I get to do my ceremonial circling before I go potty. I have to pee girl-style though to aim for the mulch. They all like it coz it does not stink even if I pee many times. And I pee a LOT coz of the steroids. They can just throw a pail of water to rinse it since it drains by itself. 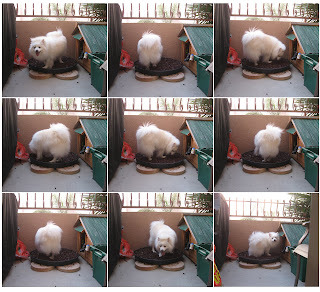 It is easy to pick up poop too coz of the mulch. She calls it the patio potty even though it's on a balcony. It just sounds better. Haha! Never having to scrub the patio floor again.. Priceless! Teehee!